Brand: McDonald's Corp., of Oakbrook, Ill. Components inside of the whistle can detach, posing choking and aspiration hazards to young children. McDonald's has received two reports of children who coughed out pieces of the whistle that they had sucked into their mouths, including one child who received medical attention. This recall includes about 2.3 million whistles nationwide. The recalled whistles are red and were included in a plastic Hello Kitty figurine holding a pink heart-shaped lollipop. The whistle can be removed and used to make sounds by inhaling or exhaling through the mouthpiece. When closed, the figurine measures about 3 inches in height and width and 1 3/4 inches in depth. The whistle measures about 1 3/4 inches in height and width and 3/4 inches in depth. 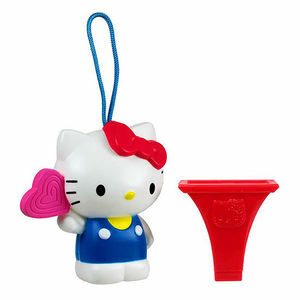 A picture of Hello Kitty appears on both sides of the whistle. The text "©1976, 2014 SANRIO CO., LTD." appears above Hello Kitty's face on the whistle, and "Made for McDonald?s China CCW Chine" appears below Hello Kitty's face on the whistle. The bag in which the toy is packaged includes the text "Hello Kitty® Birthday Lollipop" and the number "6" in the upper right corner. McDonald's restaurants nationwide from October 2014 through the first week of November 2014 with Happy Meals and Mighty Kids Meals. Immediately take the whistle away from children and return it to any McDonald's for a free replacement toy and either a yogurt tube or a bag of apple slices. For more information, call McDonald's at (800) 244-6227. For additional information, contact McDonald’s at (800) 244-6227 between 7 a.m. and 7 p.m. CT, seven days a week, or visit the firm's website at www.mcdonalds.com.